Free-flowing strategy with a wealth of features. An element of grind, but plenty of satisfying moments too . This review was written by Jon Morcom. Venice, 1455. The Renaissance is stimulating dizzying levels of creativity and La Serenissima is acknowledged as if not the crossroads, then at least the Spaghetti Junction of all trade in the Occident. Born into a city rife with political manoeuvring, family feuds and rising damp, you are Giacomo da Narni, continuing your family's proud mercantile tradition and advancing yourself socially until you reach the exalted title of Doge. 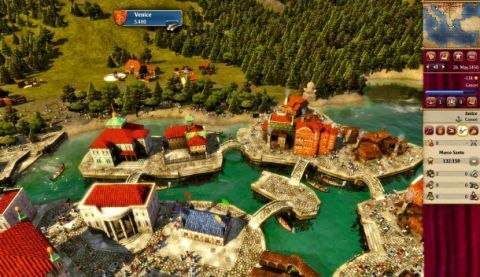 Deals are brokered, backhanders paid and rivals financially hobbled in this trade-based strategy game, which plays out in and around 25 coastal cities, beautifully represented in 3D on a map of the eastern Mediterranean and its surroundings. Starting with a single ship, you must gradually establish a trade network, convoys crisscrossing the glistening seas to deal in city markets stocking the game's 22 commodities. The enjoyment and profits come once you've grasped the dynamic pricing system, based on time-honoured supply and demand principles: identify gaps in the market, then exploit them mercilessly. Sitting in spotty-bottomed judgment of your actions is Venice's Council of Ten, as conniving and self-serving a bunch as you'll see outside of PM's Questions. Provided you meet the prescribed asset requirements, this band of chinless wonders vote on your social advancement (levelling-up) and political destiny with an amusingly animated show of thumbs up or down. You're competing against three other prominent merchants, all of you expanding your influence at home and abroad through canny dealing and enhanced production facilities. Your own family – plus disreputable types found in taverns – can assist in sabotaging your competitors' interests, but expect to swear inventively when your rivals similarly scupper your aspirations. Naval battles are minigames that can be automated or fought manually, and provide respite from the bean-counting, while volcanic eruptions, fires and plagues affect cities and create fleeting business opportunities. Act swiftly and you can even profit from your rivals' misfortune, but the game is realtime rather than turn-based and the clock is always ticking, as maintenance costs eat into your cash reserves. It's all about generating reliable income streams to keep your coffers full while simultaneously enhancing your standing. I certainly found that a grease-and-appease approach helped to curry favour whenever key votes loomed. Like the 'acqua alta' that periodically floods the real Venice, novices might be overwhelmed by the deluge of information required to keep all the plates spinning in this challenging sim. But with four different game modes and onion-like layers of resource management, political interest and subterfuge, the deal that Rise of Venice presents is a fair one.